What – Nadal Just Can’t Beat THIS Guy Either? 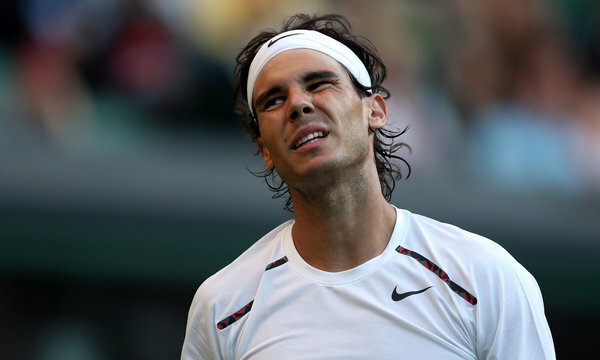 The hardwatching staff yields to no man in our admiration and respect for Rafael Nadal. So it’s not bad enough that he’s been buffeted by Hurricane Novak the past year and a half? WIMBLEDON, England — Lukas Rosol was keeping it simple against Rafael Nadal, crushing serves and ground strokes at every reasonable and sometimes unreasonable opportunity. The critical question was simple, as well: Could he somehow keep it up? Could Rosol, the world’s 100th-ranked player, really keep making enough huge and perfect swings to ruin Rafael Nadal’s Wimbledon in the second round? No question – this was not Rafa’s best showing, either from a playing or a professional standpoint (he whined to the chair during the third set, and intentionally bumped into Rosol during a crossover). But . . . he met a guy who played the game of his life (hardwatching staff prediction: Rosol will go out in three next round) and could have beaten anyone yesterday. But he beat Nadal (who committed 16 unforced errors in five sets). This is getting downright Biblical. This entry was posted in Uncategorized and tagged bumped, Hurricane Novak, Lukas Rosol, Rafael Nadal, Wimbledon. Bookmark the permalink. 1 Response to What – Nadal Just Can’t Beat THIS Guy Either?